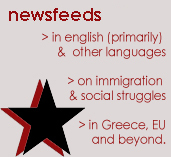 Before the crisis, society could only gain from its solidarity to immigrants and refugees. Now, if it doesn’t show solidarity, it has a lot to lose. 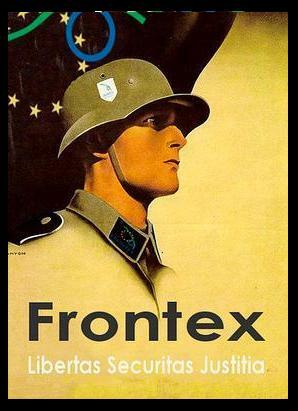 Remember the last time a crisis broke out and there was talk of “scapegoats” and “concentration camps”: It was the 1930s and those who talked like that were called Wehrmacht, not Frontex. Immigrants are kept illegal. In whose interest? For two decades, illegal immigration has offered Greece cheap, undeclared labor for a series of developmental mega-projects, like the scandalously excessive Olympics, and a variety of grand and minor businesses. At the same time, circuits of illicit trafficking were created with extremely high profits. The system keeps the immigrants illegal not only for the direct profits generated by illegality and insecurity, but also in order to undermine and obliterate the rights of immigrants, as well as the rights of locals. When the bosses treat immigrants as human trash, and society accepts this, soon society as a whole is turned into a human rights wasteland. Greece is becoming a prison state. In whose interest? Even government officials admit that border walls and fences, concentration camps and floating prisons, (these are the measures that have been mentioned by the Greek authorities), will not halt the entrance of desperate immigrants into Europe. The point of such measures is to disorient people by absorbing public attention, as well as to increase the profits of traffickers in the new slave trade (which in turn increases the death toll of immigrants trying to enter Europe). The plight of immiserated refugees in neighborhoods in Athens, Patras and Igoumenitsa is a bargaining chip in the negotiations of Greece with the EU and Turkey. By constantly presenting repression, the police and the army as the solution to social issues, they are paving the ground for the military-economic dictatorship of the IMF. Production of necessary goods through the human activity of work, in a society of equality and in balance with nature, always increases social wealth. In such a society there is room for everyone. But when humanity, reason, common sense, civil and social rights are ostracized, then there is no room for anyone at all. In other words, the more we allow for rights to be undermined, the less room there is for all of us. Some time ago, we were told that there is no room for refugees, for immigrants. Now we are being told that there is room neither for civil servants, nor for industrial workers and builders (a worker in China earns 85 Euro a month and can hardly unionize, so it is only natural for the bosses to prefer devalued labor), nor for agricultural workers (150,000 small or medium agricultural workers abandoned production in the fields before the crisis broke out, and Greece has been transformed from a sovereign food producer, to a major importer of food). For twenty years now, the multinationals and the bankers’ mafia have been transferring their capital and companies to places where profits are higher and workers’ rights are inexistent, while at the same time they are destroying vital resources, economic and social networks of whole countries through the mechanism of credit and debt. 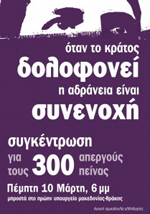 From Konstandina Kuneva, an immigrant cleaner fighting for her fellow-workers’ rights, to the strikers in the strawberry fields in Manolada in 2008, from the Egyptian fishermen struggling for justice in Mechaniona in the winter and spring of 2010 to the 35 hothouse workers on hunger strike in Ioannina last December, from the strikers at the Skala in Lakonia last September to today’s 300 hunger strikers, the fighting migrant workers show the way of resistance and dignity. If we have any chance to resist the nightmare looming in the horizon for all of us, this chance depends on our solidarity with the migrants in struggle. This entry was posted on 24 January 2011 at 7:40 pm	and is filed under Other Groups' and Organisations' Releases. You can follow any responses to this entry through the RSS 2.0 feed. You can leave a response, or trackback from your own site.